Though I'm way behind on posts, I just have to do a quick one to say what a treat the last week has been for Federer fans. We have seen four matches so far and in each one Roger has looked simply amazing. It's like going back several years in time to watch him tear around the court, using his full arsenal of shots, and really looking more like a 23-year-old rather than the 33-year-old father of four. Last year it seemed almost too much to hope that he could be back to this level again. Yes, we knew he was being hindered by a back injury, and I was getting incredibly frustrated by those writing him off when his body just wasn't letting him play his game. But I don't know if I truly believed he could be back to the level he currently is at given his natural aging process. Now, I realize there is still a long way to go to win this tournament. He has some difficult matches coming up. But with the way he is currently playing it's not unreasonable to believe he could be the one holding the trophy come Monday. 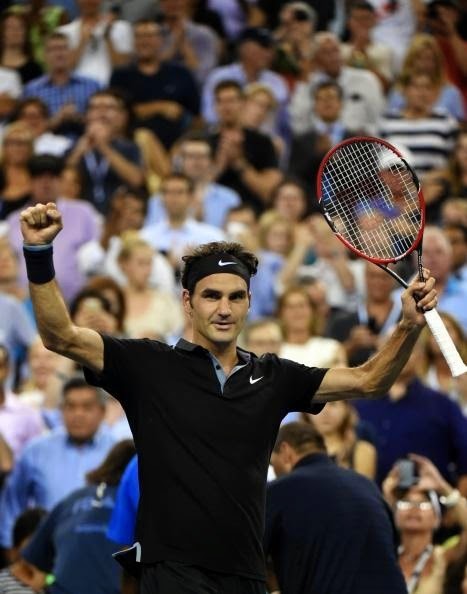 There is so much that is amazing about Roger Federer - the incredible records he hold; his graceful and beautiful game; the way he gives of his time to his fans, the media, his foundation, in such an unselfish way; being able to continue to travel the world and stay in the top 5 with two sets of twins(! ); and now the way he is proving so many who thought he had nothing left completely wrong, regardless of the final results of the U.S. Open. I continue to be amazed over and over again. I'm not going to bother to go through the matches he has played so far; I'm too far behind in that as it is and there are hundreds of articles already. I just wanted to express a little more awe in what The Maestro continues to accomplish. And I continue to have great hope for what the next week will bring.